We welcome you to attend the 4th World Heart Congress from April 29 - May 01, 2019 at Kyoto, Japan which melds brief Keynote presentations, speaker talks, Exhibition, Symposia, workshops and special sessions. This event is CME and CPD Accredited. 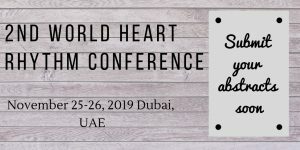 Key Figures of Heart Congress 2019 | Kyoto This international conference provides the opportunity for … Continue reading "4th World Heart Congress"
It takes immense pleasure to welcome you all for the upcoming “23rd International Conference on Primary Health Care and Nursing ( Nursing Health 2019 ) to be held during April 29- 30, 2019 Helsinki, Finland .This two day event will include expert keynote talks, symposium and plenary lectures, Poster sessions, Young Researchers Forum, Exhibitions, B2B Meetings, Scientific networking etc. … Continue reading "23rd International Conference on Primary Healthcare and Emergency Nursing"
2nd World Heart Rhythm Conference is among the World's driving Scientific Conference to unite worldwide recognized scholastics in the field of cardiology, cardiovascular researchers, educators, health professionals, professors, academic scientists, industry researchers, scholars from around the globe concentrated on finding a few solutions concerning Cardiovascular Diseases, this is your most clear chance to achieve the best amassing of … Continue reading "2nd World Heart Rhythm Conference"